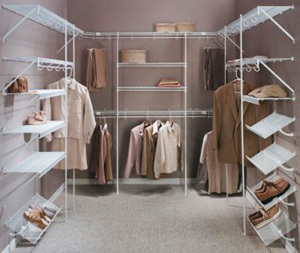 Our closets use ventilated shelving with a finished coating of epoxy-polyester which provides a hard and durable finish. Our shelving will not rust, crack or peel. Its epoxy finish is non-toxic and enviromentally friendly. Reach-in closets allow you to customize your single and double hanging space to suit your individual needs. Add a tower of shelves for added convenience. Freeslide shelving allows the continuous flow of hanging garments, even around corners. Hanging garments move freely along the unique slide bar, making clothes selection even easier.